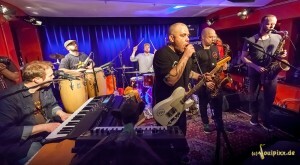 Funk pur, das war die Devise am Donnerstag im Jazzclub Hannover. stellten hier ihre Soloprojekte vor und gaben ihrem Namen alle Ehre. Zwei Stunden Funk in glasklarerm Sound ließen nur Wünsche nach noch mehr offen! Funk and more funk, that was the mission last thursday at the Jazzclub Hannover. Jonas Wall and Magnum Coltrane Price (both known from bands like Nils Landgren Funk Unit or Mezzoforte) played this night their soloprojects. Two hours full of fantastic music in excelent quality! For more photos klick here!